Thousand and One Nights, also called The Arabian Nights' Entertainment or simply The Arabian Nights, is a sprawling, centuries-old collection of tales. 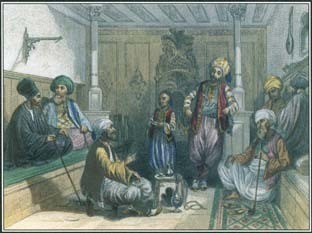 In the English-speaking world, it is the best-known work of Arabic stories. Thousand and One Nights, also known as The Arabian Nights, is a collection of Arabic tales, fables, and poems. marrying the king, she told him a story on their wedding night with the promise to finish it the next day. He let her live, and she repeated the trick. So captivating were her stories that Shahriyar spared her life again and again in order to hear the rest of the narrative. The origins of Thousand and One Nights are unknown. The oldest bit of Arabic text dates from the 800s; the first lengthy text was written in the 1400s. None of the early Arabic-language texts contains exactly the same stories. Scholars have identified Persian, Baghdadian, and Egyptian elements in the work, which seems to have developed over the years as an ever-changing collection of fairy tales, romances, fables, poems, legends about heroes, and humorous stories. The stories that are best known in the English-speaking world—those of Sinbad the Sailor, Aladdin and his Magic Lamp, and Ali Baba and the Forty Thieves—do not appear in all editions of Thousand and One Nights. See also Aladdin ; Sinbad The Sailor .